"Here is a FREE pattern for you! It celebrates my first fabric collection with RJR – Flutter. All applique is fused and blanket stitched. 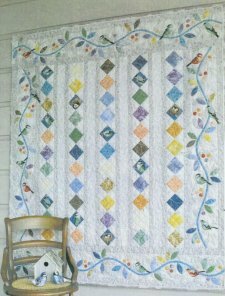 The adorable birds are broiderie perse (which means the birdies are simply cut from the main fabric and blanket stitched on the edges) and the square on square blocks can be paper pieced for assured accuracy. This quilt will spice up any environment as you fluff your stuff in your own creative nest. Call your local quilt shop for availability."